To start out, I’ll dispense with the obligatory introduction describing the importance of Fred Rogers and his iconic TV show, “Mr. Rogers’ Neighborhood,” to two generations of Americans. If you’re a Gen-Xer or a Millennial, you know this already. 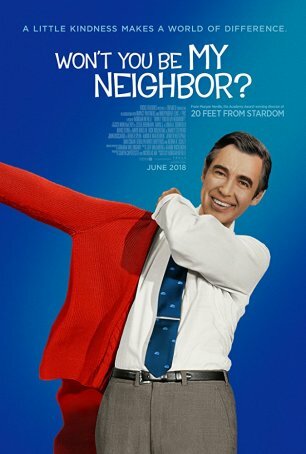 Won’t You Be My Neighbor?, from director Morgan Neville (20 Feet from Stardom) is a standard-order biographical documentary about Mr. Rogers that focuses primarily on the period between 1968 and 2001, when “Mr. Rogers’ Neighborhood” was in its first run (it continues to be shown in repeats on some PBS stations today). The film is straightforward and respectful, featuring excerpts from archived interviews with Rogers, new discussions with various members of the TV cast (and Joanne Rogers, his widow), and a trove of clips from the show. It’s not a hit-job (perhaps because making a “negative” movie about Mr. Rogers might be nearly impossible) nor does it dish the dirt (perhaps because there’s none to dish). It’s an excellent companion piece for those who remember watching the show as a kid but it may come across as a little boring for anyone unfamiliar with “Mr. Rogers’ Neighborhood.” Although the movie presents an effective portrait of Rogers, those who didn’t spend endless hours watching him on TV may be left wondering what was so special about a TV show that looks hopelessly dated by today’s slick standards. Many (most?) people who were children in America between 1965 and 2000 watched “Mr. Rogers’ Neighborhood” at one time or another (for me, it was between 1972 and 1974 – relatively early in the series’ run, which started in 1968). Won’t You Be My Neighbor? takes viewers back to the 1960s and the genesis of the show. It provides glimpses of “Mr. Rogers’ Neighborhood” in its early days and shows that, from the beginning, Fred Rogers was interested in tackling difficult subjects – such as the Vietnam war, assassinations, and the importance of diversity – in ways that children could understand. Rogers championed inclusiveness, adding Francois Scarborough Clemmons to his cast of regulars in the early days. Clemmons is a gay black man and, although Rogers (a Presbyterian minister) was initially uneasy with Clemmons’ sexual identity, his views changed over the years. Neville interviews Clemmons and the actor/singer comes close to breaking down when recounting an incident of kindness. The thing that differentiated “Mr. Rogers’ Neighborhood” from the many other children’s TV shows of the time, including PBS’ other giant, “Sesame Street,” was its sense of comfortable familiarity. Ask anyone who watched the program what they remember about it, and you’ll get the same catalog of references: Rogers taking off the suit jacket and donning a cardigan while singing “Won’t You Be My Neighbor?”, putting on the sneakers, feeding the fish, and wrapping up the show with “It’s Such a Good Feeling.” Those things, by design, were intended to promote a sense of security. That they left indelible impressions were an unplanned benefit. The film’s portrayal of Rogers is that of a serious man who cared deeply about children and believed that television was generally being misused when it came to its outreach to them. He was a spiritual man but he never used his fame as an opportunity for evangelization. (I didn’t know he was a minister until I read an obituary in 2003.) From time-to-time, he had doubts (especially about how to address 9/11 when he came out of retirement to record a few short segments) but these things humanized him. As verified by many who knew him, the TV Mr. Rogers was the real-life Fred Rogers. He didn’t adopt a new personality the way many hosts of children’s TV programs did. Kids sense authenticity and that, perhaps more than any other factor, is why the series lasted for 32 years. Neville’s Valentine to Mr. Rogers is an adequate biography, showing such “essential” details as how Rogers’ statement before Congress led to PBS gaining public funding and how, during the 1970s, Rogers met with poor success in a new show directed at adults. We learn that Rogers had a sly sense of humor that occasionally took his co-workers by surprise. Time is spent on the genesis and evolution of the show over the years. There’s the mention of an early episode in which puppet King Friday advocates building a wall to keep out change (it’s torn down at the end). These details allow Won’t You Be My Neighbor? to stand on its own as a documentary. (The PG-13 rating comes as a result of some “salty” language used in a contemporary interview with a crew member.) The most powerful draw of the production, at least for those over age 25, is nostalgia. The film functions as a time machine to take the viewer back to when (s)he watched “Mr. Rogers’ Neighborhood” on television and re-introduces the man who functioned as a friend/mentor/father-figure. And perhaps the best feeling of all is learning that, in an era when so many icons disappoint us (I’m thinking particularly of Bill Cosby and Morgan Freeman), Fred Rogers remained a beacon of truth and honesty until the day of his death in 2003. An interview subject in Won’t You Be My Neighbor asserts that there are more Mr. Rogers out there than we suspect. In this era of division and dismissal, I hope he’s right.